Penobscot County Judge of Probate Allan Woodcock Jr.
BANGOR, Maine — The Maine Supreme Judicial Court on Wednesday honored Penobscot County Probate Judge Allan Woodcock Jr. for his nearly 50 years on the bench. The justices also honored local attorneys who have donated more than 50 hours of free legal service to clients who could not have afforded to hire a lawyer. 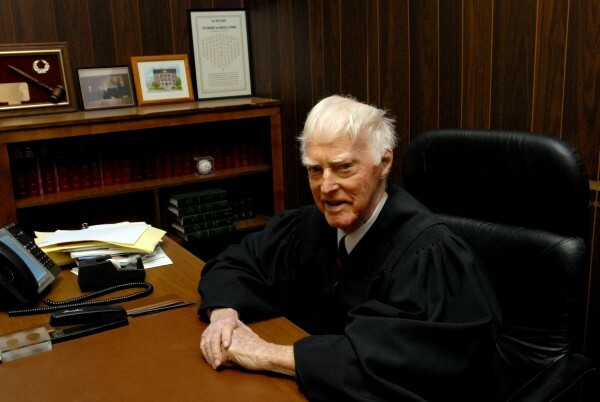 Woodcock, 92, of Bangor began practicing law in 1948. He was elected to the bench in 1963, making him Maine’s longest-serving probate judge. Saufley’s remarks and those of others were released after the luncheon. During his lifetime, Woodcock has served on the Bangor City Council and in the Maine House of Representatives and Maine Senate. “They gave me some very fancy sneakers and a nice plaque,” he said. The probate judge is known to wear red high-top sneakers beneath his black robe. The justices presented him with a pair of gold high-top sneakers adorned with “sparkly stuff,” Woodcock said. “They just wanted to thank someone for lasting so long in one job,” he said of the reason behind the honor. Woodcock said he has stayed in the job so long because he enjoys it so much. Woodcock was last re-elected in November 2010. Maine’s probate judges handle estates, wills, guardianships, conservatorships, adoptions, changes of name and related matters. Woodcock said adoptions have always been his favorite part of the job. “To see parents so elated and joyous at bringing a child into their families is quite a thrill,” he said. The state’s high court also honored attorneys for their volunteer work with a new award created by the judiciary. The Katahdin Counsel Recognition Program is designed to acknowledge and recognize Maine lawyers who provide free representation to Maine’s low-income and elderly residents, according to a press release issued by the judiciary. Active members of the bar who completed 50 hours or more of pro-bono work in the fiscal year that ended June 30, 2012, were eligible to register as a Katahdin Counsel. The following attorneys in Penobscot County received the honor Wednesday: Joseph Bethony of Gross Minsky & Mogul; Audrey Bryant Bracchio of Pelletier & Faircloth; Zachary Brandmeir of Brandmeir Law; Theodore Curtis Jr. of the Curtis Law Firm; Kerry Clark Jordan of Griffin & Jordan; Cathy Roger Lufkin of Tanous Snow & Lufkin; Cynthia Mehnert and Eric Mehnert, both of Hawkes & Mehnert; Steven Mogul and Joy Trueworthy, both of Gross Minsky & Mogul; and Roberta Winchell of Cardone & Winchell. Deborah Meier Carr of the Law Office of Deborah Meier Carr received the award for her work in Piscataquis County. Correction: An earlier version of this story misstated the name of one of the lawyers honored by the Maine Supreme Judicial Court for their pro bono work. She is Kerry Clark Jordan of the law firm Griffin & Jordan.